This is one of the greenhouses in the university 'physic' garden of Cambridge. The botanic garden was established in order to teach medical students about the plants from which their medicines were derived. It was a fundamental skill for physicians to know the difference between plant which could cure their patients and those which would kill. 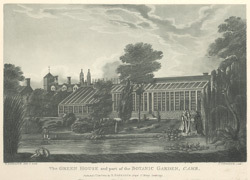 Unlike Oxford, which had established its botanical garden in the 1620s, Cambridge had to wait until 1762, when Richard Walker, Vice Master of Trinity College, left a plot of 5 acres to establish a physic garden 'for the benefit of mankind'. The gardens had a 50 metre long pond and eventually up to 2000 species of plants.